Stainless steel appliances and granite counter tops have become the go-to style for kitchens, and the look has become so prevalent that it’s almost expected. Well, it’s officially time for an update. Whether you’re considering a kitchen remodel or just looking to freshen up your space, try adding some unexpected color and texture to your kitchen with colorful kitchen appliances, ideas and retro kitchen accessories. From colorful refrigerators to eye-catching back-splashes, here are some novel ways to find new solutions for your kitchen. Your refrigerator is kind of a big deal—it’s likely one of the most important appliances in your entire home. Why not give your refrigerator some attention with a pop of color? The Artistry Series from GE offers the sleek appeal of silver stainless steel but comes with fun colors, like vibrant bell pepper red or cool cupcake blue. The chic, Energy Star-rated design stores fresh foods, veggies and beverages at the larger top section of the fridge, while frozen foods are kept down below. Who said colorful ovens had to end with Fisher-Price sets? If you’re ready to dive into color with your interior design ideas, but are hesitant to take the full plunge, consider choosing a colorful oven with a more understated stainless steel silver stove-top. We love shades like mustard yellow, forest green and cobalt blue. With a stove that vivid, you’ll always feel like you’re cooking up something spectacular—even if it’s just boxed mac and cheese. 3. Kitchen aid mixers that POP! If you’re not ready to commit to adding color with larger, more expensive appliances like refrigerators and ovens, why not test the waters with a counter-top appliance? 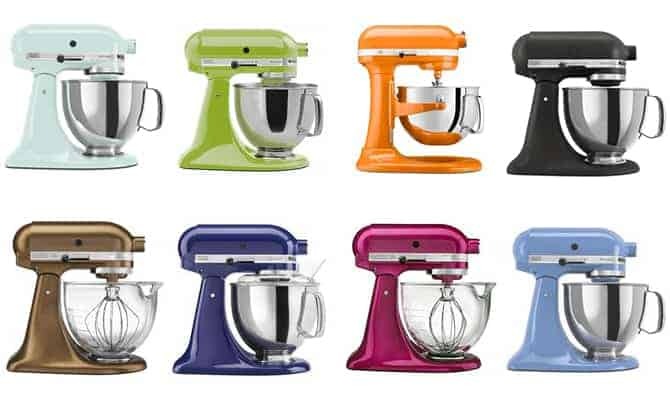 We especially love Kitchen Aid stand mixers for their gorgeous designs and colors, endless uses and long lifespans. This 10-speed, five-quart mixer doesn’t just knead dough and whip egg whites. You can also purchase special attachments to make your own fresh pasta or fruit and vegetable juices. These beautiful appliances will add a little pop of color in just the right spaces around your kitchen so you can offset the rest of your home's interior. If you’re looking to add some color to your kitchen without spending a ton of cash, try upgrading your microwave. While you’ll naturally want to choose a brand that offers eye-catching colors, you’ll also need to consider performance. If you love the mid-century modern look but don't want to shell out for a pink Smeg refrigerator, Big Chill offers their retro microwave in eight standard colors. If that's not enough options for you, choose from a selection of 200 custom colors. Go ahead—warm up those leftovers in style. Kitchen lighting is often taken for granted. While you’ll want to keep your kitchen’s overhead lighting simple and practical with recessed can lights or track lighting, why not take your task and ambient lighting up a notch? 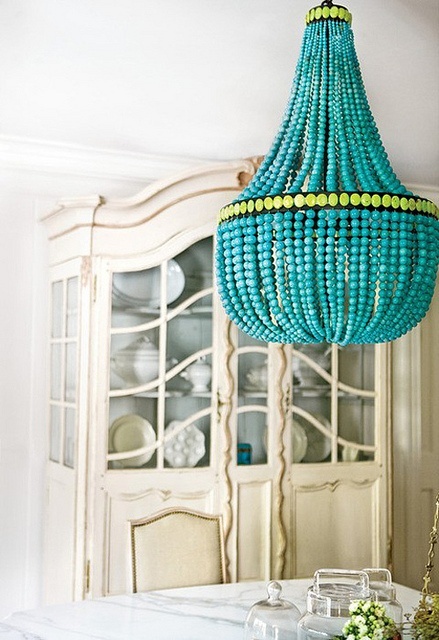 For example, draw attention to your breakfast nook by hanging a gorgeous colorful chandelier over the table. If you're looking for more task lighting in the kitchen, consider hanging some vibrantly hued pendant lights fixtures above your island to add some extra style and functionality. Though backsplashes are meant to protect your walls from all the splashes and splatters that inevitably occur in the kitchen, they’re also gorgeous places to express your personal style. If you’re willing to undertake a big project, choose a backsplash tile in a stand-out color or elaborate pattern. If you’re not quite ready to lay your own tile or hire a contractor, there are plenty of easy, affordable ways to DIY your own colorful backsplash, from vinyl decals to faux fabric "wallpaper." Like the backsplash, your kitchen floor is a great place to make a statement for your home remodel. You can make a big impact on the look of your kitchen by installing warm wooden floors or eye-catching patterned tile. For a touch of exotic, old-world charm, terra-cotta tile is an ideal choice. If you’re looking for something sleeker, try industrial concrete. Durable and modern, it’s a hygienic material that works exceptionally well in homes with more of a modern, urban loft vibe. Of course, there’s always linoleum, but don’t think you have to stick with the basic beige. Try choosing a color that pops, like green, red or even black and white. Adding a dose of color to your kitchen doesn’t have to be expensive or difficult. Whether you’re planning an entire kitchen overhaul or simply painting a single wall, these colorful kitchen remodeling ideas will definitely be worth your time.